Update: I finally found my pictures, so I’m reposting my 2012 report. I need my own camera, that works. My camera broke, and I took turns using our “big” camera (Canon SLR) and my son’s camera. Though I have scoured all the memory cards, the pictures I KNOW I took are nowhere to be found. Good news–Santa brought me this! I’m officially a fan. My tomatoes ripened 2-3 weeks earlier than my neighbors, which SIGNIFICANTLY increased my yield. I made all the salsa my family could eat (fresh and canned), and still gave away probably 20-40 pounds of tomatoes. It was lovely. I will definitely use these again! Note: I planted only one tomato plant in my east garden (which gets western, afternoon sun) and it got fried by the Walls O Water. However, the 8 plants in my west garden (which gets morning sun) did fantastic. My huge success of the year was kale. It did awesome in the early spring, just fine through the hot summer, and fantastic through the fall. In fact, there are a few young leaves on it, and then it’s done. So it lasted until December! Amazing. We had a few frosts, and one hard frost, but it was just fine. I love the way it looks like a little palm tree. In the end, my favorite way to consume kale is in green smoothies (yum!). My new trellis made from a cattle panel was awesome. Growing peas on it–less than awesome. I am going to stick to growing peas on a totally vertical trellis (this one curves across the garden). I did grow one pumpkin on it–I trained the vines to grow up and over. It was perfect! I also loved the way it supported my sunflowers. However, I planted pumpkins, zucchini, and cukes really late. I got one regular pumpkin, one baby pumpkin, and no cucumbers. 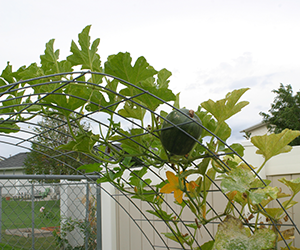 I will love this trellis in the future–mostly to grow cucumbers and squash. 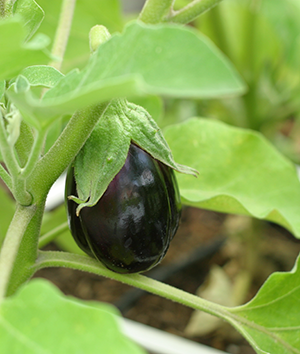 I planted two eggplant, and got one fruit. It ripened just as we went out of town to visit family, and I took it, failed to cook with it, and left it there. Bummer. I think the plants must have been missing some nutrients because they were huge beautiful plants with no fruit. They should have each produced 4-5. This year I planted 9 tomato plants. We missed having cherry tomatoes (Walls O Water fried it), but had plenty of the others. I planted 4 Roma and 4 other (salad, early girl, better boy). Next year I want 6 Roma, 1 Cherry, and two other varieties. I think I might try some heirlooms. Green beans–I planted tons of bush beans, and we loved them! Half-way through the summer I pulled out anything that was done and filled in all my empty spaces with bush beans. We ate them like crazy. Next year I want to try planting more, and freezing them. For some reason I can’t give up on the carrots, but we never really eat them. Sweet potatoes–this is my new plant for next year. We’ve been eating them a lot lately, and I want to grow my own! 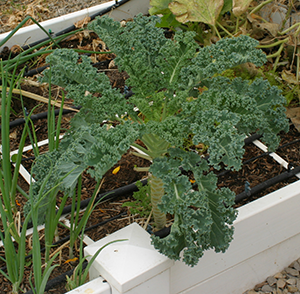 The root vegetables will not have enough room to grow if they are competing with others right next to them. Thin once they have grown some true leaves, and you can tell which is the strongest. It’s best to snip off the tops with scissors, pulling them out can bring the others with them! I have a question about thinning root vegetables, and thinning in general. How do you know when the sprouts are ready to be thinned? For example I planted 2-3 radish seeds in 16 holes in one square – they have all sprouted – do I have to thin each one, or will the radishes grow fine if I don’t thin them? Ooo, love your trellis. I’d love to have a cattle panel like that. 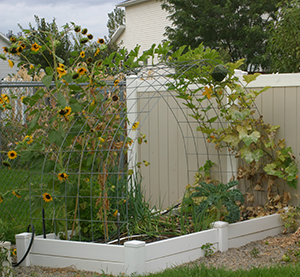 I’m going to grow cukes in my SFG this year, too, but I’m going to stack two of the inexpensive tomato cages with a tall stake down the middle for support. I just want a couple plants, so I’m going to try just 2/square and see how it goes. We’re the opposite on carrots, though — we can’t plant enough of them! This year I’m going to try starting them in April (instead of May last year) to see if I can’t get more of them in. I had a really hard time getting a second sowing to germinate in July, so if I can push the first sowing back a month, hopefully they’ll be established before it gets really hot and we’ll have a second harvest in the fall. Sometimes we can’t discern a taste difference but the actual nutritional value is very different. Plus, you are aware of what, if any, chemicals your plants are exposed to. This is also true for eggs! Mixed results. I’d say they were crowded a bit, but some of them came out huge. Flavor wise though no difference with store bought. And so long as they are in the 15cents a pound range I think I’ll still grow other things instead. But if you have some space to spare go for it, she had fun with them.